Seanan McGuire is one of the most prolific fantasy writers out there today, but I hadn’t read anything by her yet. 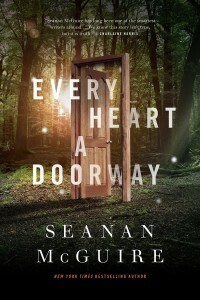 I was pretty excited to get a copy of Every Heart A Doorway to review. Also, I’ve been intrigued by the new Tor.com imprint dedicated to publishing short fiction, and so I was doubly excited to finally read a book published by them. Any fantasy reader is familiar with portal fantasy, but once you’ve found your portal, being forced back into the mundane world can be harrowing experience. This is where Eleanor West’s Home for Wayward Children comes in – it is a school dedicated to helping children who have lost their way to the fantasy world they once lived in. We follow Nancy, newly returned from the Halls of the Dead who wants nothing more than to go back, but instead she ends up in a school for misfits just like her. And just as she’s getting used to her life, her schoolmates start dying. I really enjoyed the first half of this book, where the rules of the worlds are explained and Nancy adjusts to her new school. The classification system for other worlds is fascinating, and so is learning about the different worlds that each of the people we meet went to. McGuire’s prose is lovely, especially when describing what these worlds mean to each of the characters – she actually makes being surrounded by spiders and living in a classic horror movie with reanimators and vampires sound appealing! The characters are as diverse as the worlds they claim home, but you can see how neatly the world matches their personality. I wasn’t really able to identify with Nancy’s desire to be a living statue, but she seemed like a pretty well-adjusted person otherwise. The second half of this book isn’t bad in any way, but it does switch gears into being a murder mystery. I’m a little bit tired of the murder mystery trope in general, and this novella was short enough that I don’t think there was enough time to build suspense. The murders happened really close together, and the resolution happened pretty quickly too. Plus, it still continued the story of Nancy’s acceptance of who she was and her life, so it felt like the book was trying to do a bit too much. I think it would have been a really great book if it had stuck to one of the two plots (I liked Nancy’s coming of age plot more), or maybe if it had been longer. As it is, though, I’d just call it good. I’d still recommend it, though, and I’ll be seeking out more of McGuire’s work.